Experience a real taste of the Highlands on this relaxing tour from Edinburgh. Take time to visit a working whisky distillery, enjoy the scenic beauty of the "Sma Glen”, discover historic Dunkeld plus much, much more! Departing Edinburgh we make our way to Stirling with it's ancient castle standing guard over the surrounding countryside. We'll make a stop so that you can visit the impressive Wallace Monument. This world-famous landmark was built in Victorian times as a tribute to Sir William Wallace, Scotland's great freedom fighter. We continue our tour through beautiful Glen Devon and pass the famous Gleneagles Hotel, the venue for the 2014 Ryder Cup. The attractive spa town of Crieff is the location of quaint Glenturret Malt Whisky Distillery *, the home of the Famous Grouse. You can get a behind-the-scenes tour of the distillery with a opportunity for a tasting and visit to the shop, a must for any whisky connoisseur. Select a tasty dish from the lunch menu in the restaurant or take a stroll in the distillery's extensive grounds. Next we venture into the Highlands taking the picturesque route through the "Sma Glen” and Strathbaan. Here the scenery takes on a rugged splendour, which is a fine introduction to the Highlands of Scotland. The picturesque villages of Dunkeld and Birnam are set on opposite banks of the River Tay in the heart of Highland Perthshire and make a very pleasant stop. There's an opportunity for a gentle strollwhen we stop at The Hermitage, an impressive wooded gorge. A pleasant walk will reward us with views an 18th Century folly overlooking the dramatic Falls of Black Linn. 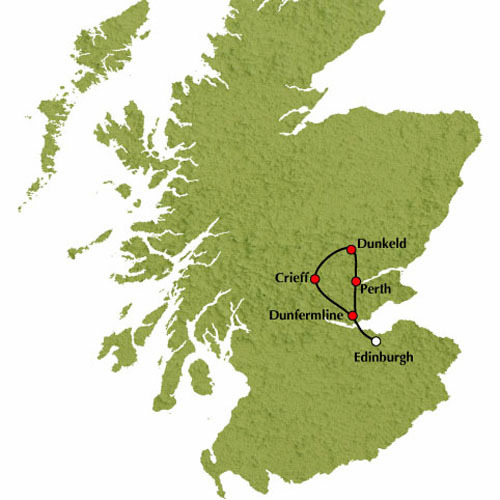 After our leisurely stroll we head southwards and travel through the undulating hills towards Perth and then through the Kingdom of Fife. Watch out for Loch Leven, forever linked to the tragic story of Mary, Queen of Scots. Enjoy fine views of the Firth of Forth and the Forth Bridges when we make our last stop of the day in pretty South Queensferry. It's a short drive back to Edinburgh. Highlights: Stirling, Wallace Monument, Glen Devon, Crieff, Glenturret Distillery, the "Sma” Glen, Dunkeld, the Hermitage, The Forth Bridges and South Queensferry.